(Nanowerk News) Organic materials are increasingly being applied in cutting-edge technologies. Organic semiconductors, for example, are being used to develop paper-thin, plastic LED screens. Materials scientists need to understand the structures and physical properties of organic materials at the atomic level to optimize the efficiency and increase the life span of devices that incorporate them. 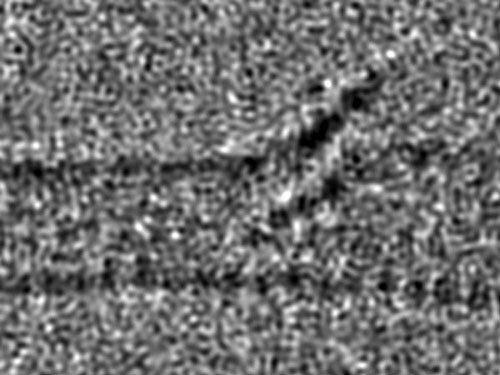 Previously used techniques for this purpose have had their limitations although high-resolution transmission electron microscopy (HR-TEM) has recently successfully been used to visualize the structures, movements and reactions of single, small organic molecules. Now, for the first time, a team of researchers from Kyoto University's Institute for Integrated Cell-Material Sciences (iCeMS) and Japan's National Institute of Advanced Industrial Science and Technology together with colleagues from Finland's Tampere University of Technology has successfully used HR-TEM to visualize a certain type of organic molecular interaction at the atomic level ("Molecular interactions on single-walled carbon nanotubes revealed by high-resolution transmission microscopy"). They linked pyrene, a hydrocarbon composed of four flat benzene rings, to a single-walled carbon nanotube that the researchers used as a scaffold for this purpose. They then used HR-TEM to see the link. "This same methodology can be used to study any organic molecules that contain an aryl group," says Tomokazu Umeyama, the study's lead investigator. An aryl group is a group of atoms derived from benzene by removing a hydrogen atom. "The methodology has the potential to provide indispensible information regarding molecular interactions," he says.